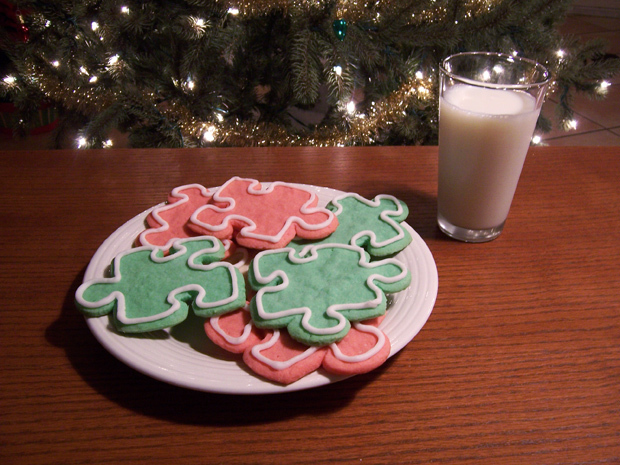 It's Christmas Eve and this year we're leaving Santa a special plate of cookies shaped like jigsaw puzzle pieces! Merry Christmas from all of us at Crazy4Jigsaws! Click here to play our plate of cookies as a puzzle. Yum Yum! I wish you a very Merry Christmas Kevin & Laura, also many thanks for a great Crazy4jigsaws year. Happy Christmas. Good festive puzzle. Merry Christmas to All CRAZY4JIGSAWS STAFF & PLAYERS. REMEMBER THE REASON 4 THE SEASON! dianna in Fl. Nice! Wish you had sent me some. Wonderful puzzle from a wonderful company. Merry Christmas! I can't wait to see what you'll have for us for the New Year celebration! Santa is going to love those cookies. Keep on coming up with the amazing pictures!!! !I Like your site! But I have a suggestion: Can you all come up with some pretty Indian and western pictures to put together? I would appreciate it. Merry Christmas & Happy New Year! Crazy4Jigsaws the best puzzle website hands down! I look forward to more new ones in the coming year.... love it!